Ramapo College is the first in New Jersey and one of the first primarily undergraduate colleges in the United States to offer a baccalaureate degree in bioinformatics. The curriculum for this program has been designed to build a solid foundation in modern life sciences as well as cutting-edge computer technology. In advance courses, students are then trained to manage biological data, develop computational methods for analysis and integration of the data, solve scientific problems and make new discoveries. In addition to the scientific and technical concepts, students are also exposed to the social, business, and ethical aspects of science. 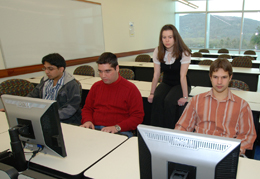 The bioinformatics program at Ramapo College provides high quality career-oriented training. There has been an unprecedented demand for bioinformaticians to join the forefront of research areas in industry as well as academic institutions. 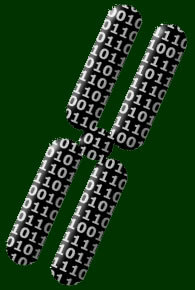 In fact, bioinformatics has become one of the most sought-after skill sets in the current market. Therefore, students graduating with this major have many attractive career options. Northern New Jersey is a hub for the pharmaceutical industry and one of the largest centers for biotechnology. It houses many major companies like Wyeth, Novartis, Pfizer, Pharmacia, Bristol-Myers Squibb, Merck. Many of these industries have high priority programs in bioinformatics and seek individuals trained in this cutting edge technology. Ramapo College is conveniently located near such potential employers as well as instiutions of higher education that offer graduate degrees and research opportunities in bioinformatics research and related disciplines. Ramapo College bioinformatics majors working on projects in a state-of-the-art bioinformatics computer lab. The Ramapo College bioinformatics program prepares students to obtain employment in the industry and acadamia, pursue graduate education, careers in medicine and related disciplines, or engage in research in this technological field of great demand. Some examples of the job options for bioinformatisc graduates include: research scientist, bioinformatics programmer, physician, project manager, database developer and administrator, technical assistant and technical sales representative (some of these may require graduate education). In addition to the pharmaceuticals, potential employers include research labs in academia, hospitals, governmental agencies, software industry, bioinformatics service industry and many more. Bioinformatics jobs offer decent salaries and are easy to find. Highly qualified and experienced educators teach the courses in the bioinformatics curriculum. Faculty members are actively engaged in research and typically involve undergraduate students in their projects. The areas of faculty research interest include: molecular bilogy, genomics, proteonomics, algorithms, object-oriented programming, pharmaceutical chemistry, Molecular Genetics of the Bone Formation, artificial intelligence, genetics and database design. Bioinformatics majors can participate in research projects under faculty supervision for credit. They may also work through the cooperative education program for industrial work experience. Many students can obtain paid summer research internships. Students are encouraged to present their research accomplishments at national and international conferences.